Valentine’s Day crept up on me this year. My best excuse is that, like everyone in Michigan, my head is spinning from weather whiplash. Between the Polar Vortex and springlike temperatures, we’ve had 60 degree temperature variations in a three day period TWICE in the last few weeks. So no wonder I don’t know what month it is. in a rocket ship made of glass and stone. 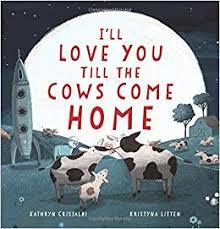 I will love you till the cows come home. The rhymes continue, vowing to love until the yaks come back, the sheep set sail, the wolves return, and so on. Kristyna Litten’s charming illustrations bring the animal adventurers to life and made me smile through every page. The short rhymes offer a perfect opportunity to create new verses. Imagine students writing new tributes vowing to love until the sharks swim by, the antelopes leap, or the cats cavort. I would love to hear them, and I’ll bet Kathryn Cristaldi would, too. My second picture book find, T.L. McBeth’s Robot in Love, answers the question, “What would be spark love at first sight for a robot?” The book leaves the reader guessing until near the end, as the lovesick robot glimpses and then seeks his love. You’ll have to read the ending for yourself, but it definitely involves escaping household appliances! Again, Robot in Love could spark new imaginary adventures. Students might write romantic adventures for other robots–original or pop-culture familiar–or perhaps for other mechanical devices. What might cause a car to fall in love? A bicycle? What about a tablet or a refrigerator? What fun! For more Valentine’s Day options, take a look at Valentine’s Day blog posts past. My favorite is still the LOVEly Flexible Thinking post. Check out the Venn diagram Valentines–and enjoy this chance to think about all things loving. What do we need more? « Bread Bread Bread. Hats Hats Hats. Voyages in a Book.